As a web design agency, you need certain tools in order to be able to create beautiful websites quickly – and to effectively collaborate with your team and clients. 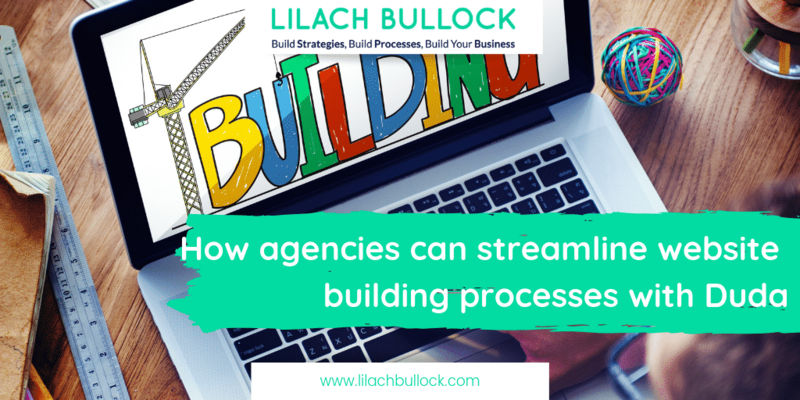 And most of all, you need to be as efficient as possible in all of your work, in order to scale your agency. In this blog post, I’m going to show you how agencies can streamline website building processes with Duda. What is Duda, and who is it for? The short answer? 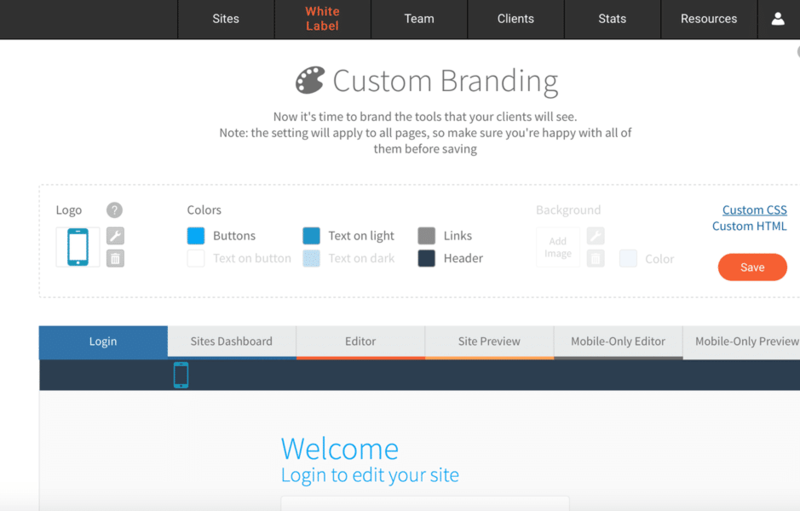 Duda is a responsive website builder. That said, there are a lot of great website builders out there – the better questions are, what exactly can you do with it? And why is it a great solution for agencies? 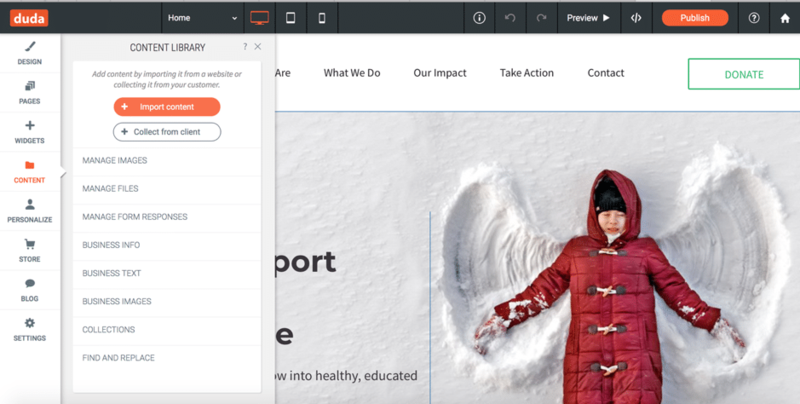 One of Duda’s best selling points is that it’s built to help agencies build websites quickly and at scale. Beyond agencies, it’s also a great option for hosting companies and other larger digital services platforms that want to offer their customers the ability to build their own websites as quickly as possible, while not compromising on quality or extra features like content personalization and e-commerce functionality, for example. As I mentioned before, one of Duda’s biggest selling points is the fact that it’s perfect for web design agencies. 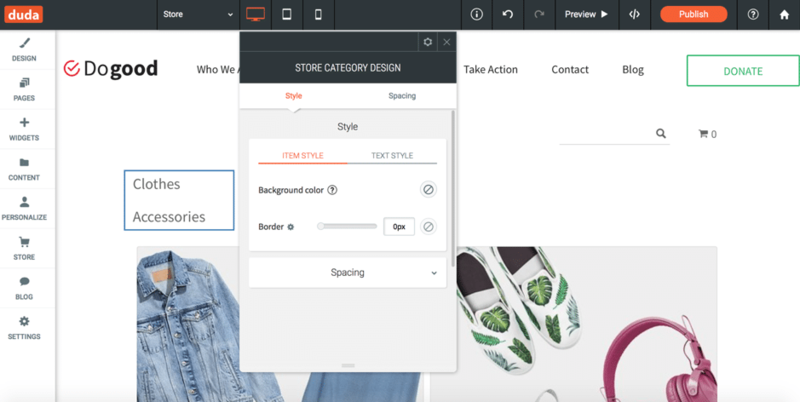 That’s because it not only makes it easy to build a plethora of websites at scale, but also because of its powerful client management features and design collaboration tools. Once you’ve created your account (and by the way, you can start the free trial with no credit card required), you’re taken right into the builder. 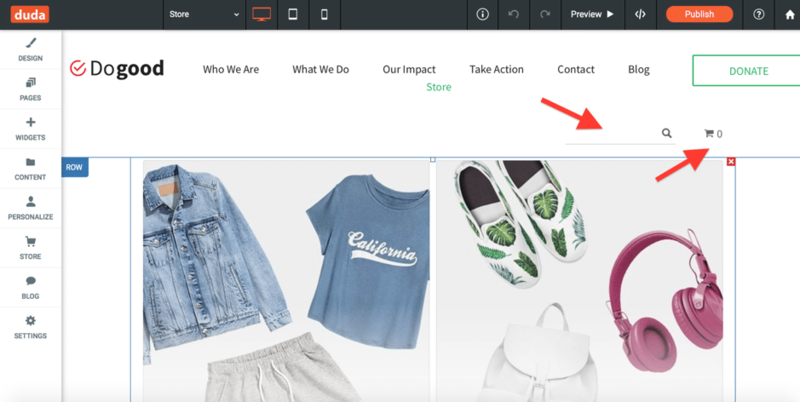 Your clients will be able to see this dashboard when they log in so that they can see your work and give you direction. This will make it so much easier to manage your workflow as a team; everyone will be very clear on what their role is and what exactly they need to do. 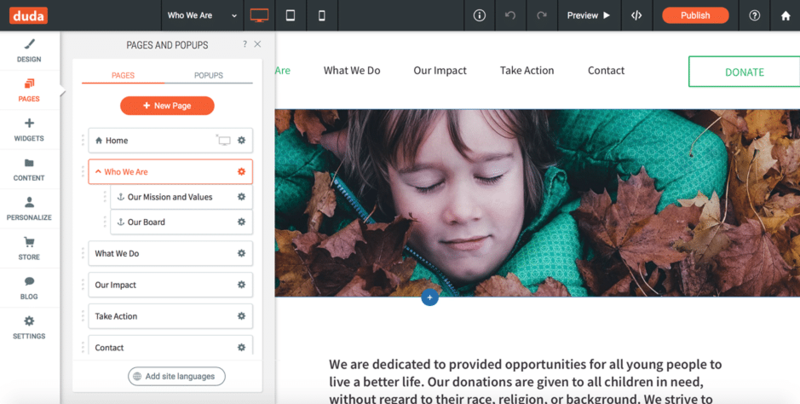 It’s also worth mentioning at this stage that you can also automate workflow communications with your clients, using smart email templates to get clients to take a certain action that you need them to – such as adding more content or viewing their weekly analytics reports. Getting started with Duda: how easy is it really to build a website? You can customize these templates to your heart’s desire and plus, you can create your own templates from scratch (and save them to reuse). Duda pulls both content and information from any website or Page, including addresses, social media links, and images. As you can see above, there are numerous options, including adding maps, click to call or click to email widgets, photo galleries and image sliders, contact forms and online scheduling calendars, among many others. 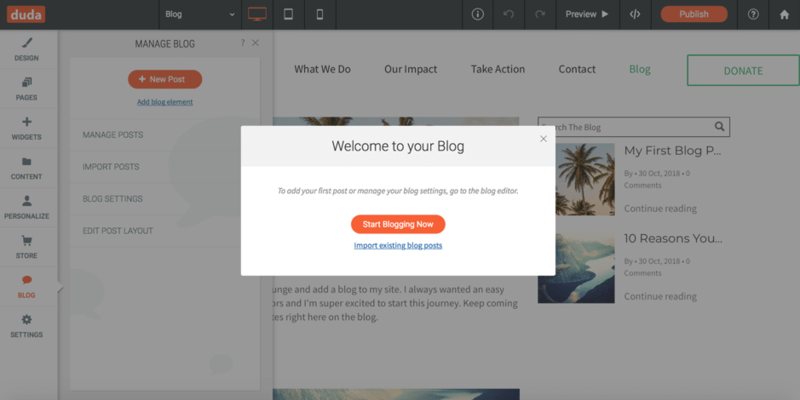 If you want to also add a blog, it’s as easy as clicking on a button: create blog. 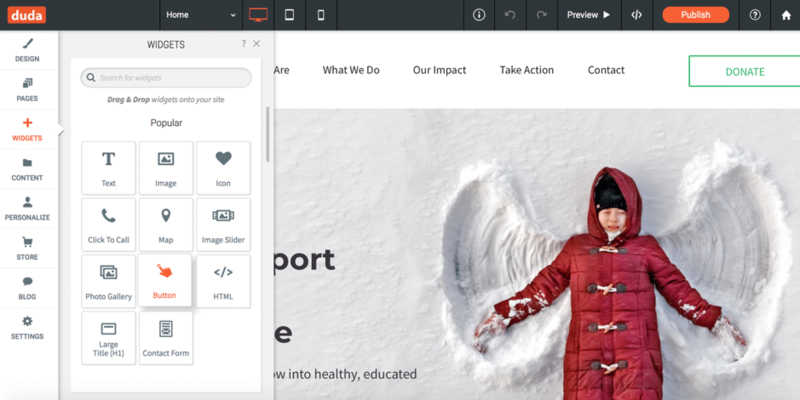 You can manage your clients’ blogs fully from the platform, including creating new posts, setting up an RSS feed, and editing existing blog posts. That said, the possibilities are endless; it’s all up to your imagination (and skill). Personalization is becoming increasingly important, particularly for businesses. Delivering personalized content and experiences ultimately helps you (or your clients) convert more visitors, whether it’s to get them to buy something from you or make an appointment, among other actions. 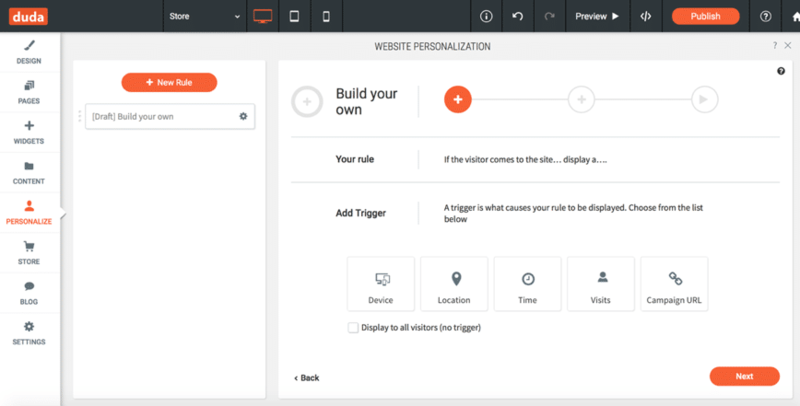 First, you select the trigger; for example: what device the visitor is using, their actual physical location, the time, and the number of visits they made to your website. 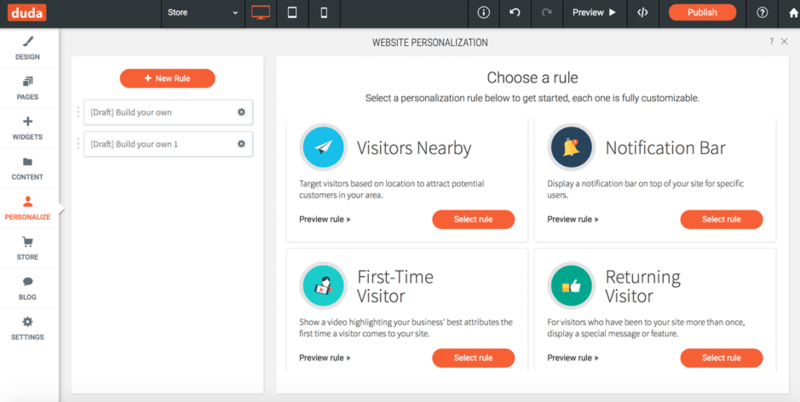 These types of personalization techniques will ultimately help your clients convert more visitors into customers, or get them to take any other action your clients want them to. For example, if the same person visits your client’s website on five different occasions, you can trigger a pop up to offer them a coupon code or a free phone consultation. Or, if your client has a special offer, but only for brick-and-mortar customers, you can set up a trigger to display the special offer only to people who click through to the website from Google Ads targeting people nearby. Most basic website building platforms don’t offer anything like this, so it’s a great way for an agency to provide more value to their clients – i.e. helping them convert more visitors and get them to take action. There are numerous options to choose from, like the ones in the above screenshot – many of them built to help you convert more visitors and make more sales. 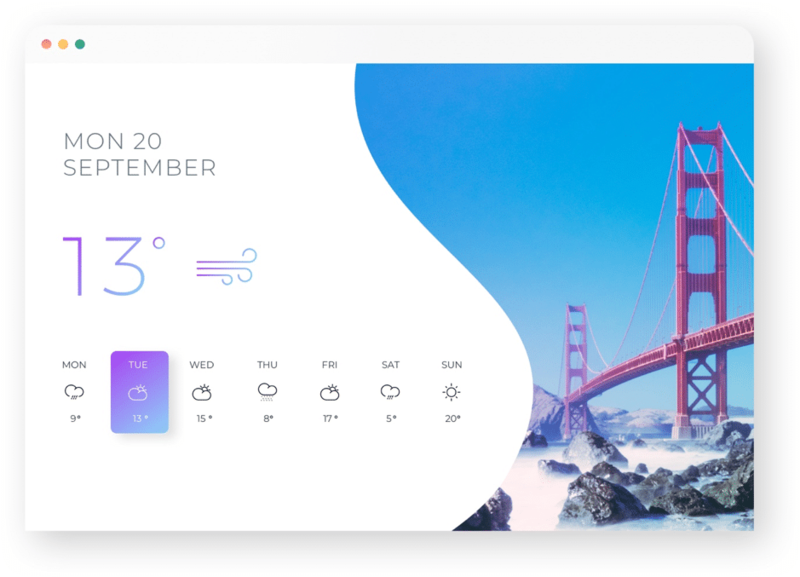 Duda is a very intuitive and easy to use platform that can be used by both beginners and experienced pros in the art and business of website design. 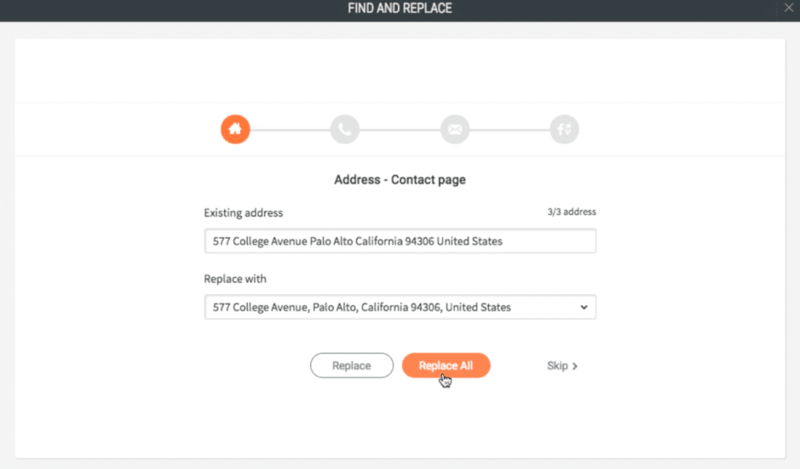 Plus, although it might be built primarily for agencies that want to scale, it’s actually a great option for small and medium businesses too. However, it’s agencies that can make the most out of this platform – use it not only to create more websites faster than ever, but also so that you can simplify the entire process, from collaborating with your team to getting your clients involved.